How many times have you read or been told that the secret to happiness is to become debt free? If you’re over the age of 30 you probably can’t begin to estimate how many times you’ve heard or read this. It’s easy to want to become debt free. The problem is that doing it can be very tough. You may even have tried several times to get out of debt and failed. If so, consider what Dale Carnegie wrote, “Develop success from failures. Discouragement and failure are two of the surest stepping stones to success”. If you truly want to become debt free the first thing you need to do is some self-analysis – to determine why you’re continually in debt. The simple answer to this is that you’re living beyond your means – that you’re spending more than you earn. But you need to dig deeper than this. Are impulse purchases the problem, that you just can’t resist buying the latest computer or the newest smart phone even though you know you can’t afford it? Is it because you’re trying to keep up with friends that earn more than you do? For many people the problem is that they’re just unwilling to make the necessary sacrifices. Does this sound like you? Do you know you should get rid of cable TV but you just can’t imagine life without it? Are there other things in your life you know you should give up but you just can’t bring yourself to make the necessary sacrifices? Could it be because you fear change? Debt can actually be sort of comfortable once you get used to it. If you’ve always had four or five credit cards, a personal loan and an auto loan you at least know what to expect. The unknown of what life would be like without debt can be scary. But as thousands of Americans have found that becoming debt free changed their lives and for much the better. Once your figure out why you’re continually in debt what you need to do is change your behavior. For example, if your problem is impulse buying one simple answer is to stay away from those places where you’re likely to make impulse purchases. If you have a hard time resisting the impulse to buy the latest electronic gadget, then just stay away from stores that sell electronic gadgets. If clothes shopping is your Achilles’ heel try to stay away from clothing stores. If the reason why you’re always struggling with debt is because you’re unwilling to make the sacrifices necessary to get your spending under control, try it one step at a time. Get rid of your cable TV and use low-cost alternatives such as Netflix, Hulu and Amazon Prime for your entertainment, then sit back and see how it feels. You’ll probably find after a few months that you don’t even miss cable. If you eat out a lot, try limiting it to, say, twice a week. Spend a few hours on Saturday or Sunday making three or four easy-to-fix meals, pop them in the freezer, set one out to defrost in the morning and you’ll have dinner ready and waiting. If you’re concerned what your life would be like if you were debt-free, do as the NFL quarterback Aaron Rodgers once said, which was, “R-E-L-A-X”. You’re not going to become debt free overnight so you’ll have plenty of time to get used to the idea of not having to struggle to pay your bills every month. You can do this one step at a time and the first step is to determine how bad things are. The easiest way to do this is with a spreadsheet program such as Microsoft Excel or Google’s free program, Sheets. Whichever of these you choose you will need five columns – the name of the lender, the amount owed, the monthly payment, its interest rate and its due date. 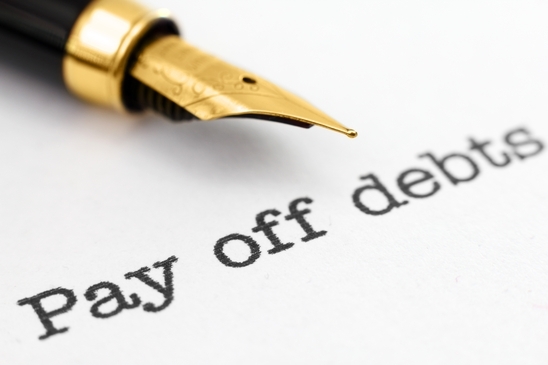 Now that you have your debts organized you need to make a plan for paying them off. There are two popular methods for doing this. They are called the snowball method and the avalanche method. If you’d like to know more about the snowball method from Dave Ramsey himself, watch this video. The other method, the avalanche method, means listing your debts from the one with the highest interest rate down to the one with the lowest. You then do everything you can to pay off that first debt. The thinking behind this is that paying off the debt with the highest interest rate will save you the most money. While this is true, it’s equally true that it will take you longer to pay off that first debt than if chose the snowball method. You can probably guess your next step, which is to choose a method and start using it. This, of course, is the hard part. Regardless of whether you choose the snowball or avalanche method you must commit to making your payments on time every month. You may find this takes more than a bit of self-discipline – especially if you’ve been ignoring your debts for several months. One way to take the stress out of this is to automate your payments. You should be able to do this through your bank or if not, just contact your lender to set up automatic payments. Do this and you won’t ever have to worry about making a payment again. Of course, you will need to make sure there is enough money in your account to cover the automatic withdrawals. Q. Who offers debt consolidation loans? A. Banks, savings institutions and loan companies al offer debt consolidation loans. It’s also possible to get a debt consolidation loan online at websites such as Lending Club and Peerform. It’s often possible to get better interest rates from an online lender, especially those that are peer-to-peer lenders. Q. How do debt settlement programs work? A. The way they work is that you hire a debt settlement company to settle your debts for you. You then stop paying your lenders and, instead, transfer a set amount of money each month to a FDIC insured trust account. When a sufficient amount of money has accumulated in your trust account to settle one of your debts, the settlement company will contact you and ask you to release enough money to cover it. This process continues until all of your debts have been settled. This typically takes from 24 to 48 months. Q. What debt is considered when applying for a mortgage? A. Your debts will not be considered so much as your credit score. The long and short of it is that you will need to have a good credit score to get a mortgage. We have heard one mortgage broker advertising that it can help people that have credit scores as low as 580 get FHA mortgages. However, you will probably need to have a score of 700 or above to get a non-government-backed or conventional mortgage. Q, What debt can be consolidated? A. Almost all unsecured debts can be consolidated. This includes credit card debts, personal lines of credit, personal loans, payday loans, old cell phone bills and past due rent (if you no longer live in that house or apartment). What debts can’t be consolidated are secured debt such as mortgages and auto loans. It is also not possible to consolidate alimony, spousal support, family support, past due taxes and college loan debts. Q. How debt affects your health? The stress related to dealing with debt can cause serious health problems including irritable bowel syndrome, constipation, colds and sinus infections, a spastic colon, diarrhea, high blood pressure, asthma and headaches.